IGAD LPI team met H.E. Kenneth M. Lusaka, the Permanent Secretary of the Kenyan Ministry of Livestock Development, on July 8th, 2010 and discussed ways through which the Policy Forum and the Information Node, which were created by the Project, could be fully and sustainably integrated within government structures. 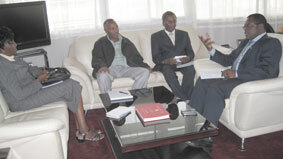 Dr Abdi Jama, Livestock Information Advisor of IGAD LPI, briefed H.E. Lusaka on the critical importance of sustainability of the policy hub and the information node in Kenya to formulate and implement pro-poor policies as well as getting the livestock agenda fully promoted in the Kenyan National Development Planning. He also briefed the permanent secretary of the upcoming study on the contribution of livestock to the Kenyan national GDP, which would be undertaken soon by an international consultant in collaboration with national experts at the Kenya National Bureau of Statistics. Commending what has been so far achieved by IGAD LPI, H.E. Kenneth M. Lusaka underscored the fact that even though livestock plays an important role in the national GDP, its profile still needs to be raised in order to keep the sector develop further to bring about a positive change in the lives of the poor livestock keepers in Kenya and across other IGAD member states. He said his Ministry would look into ways to strengthen the institutionalization processes of IGAD LPI programmes with the support of the Kenyan country national team. He further noted that the GDP study would be one significant input for their national accounts and his Ministry would be pleased to support the consultant in every way.